Gulf in the Middle East still tops as the destination of Overseas Filipino Workers (OFW) every year. So if you are planning to work in the Middle East, you can consider these three countries — Bahrain, Oman and the United Arab Emirates (UAE)! 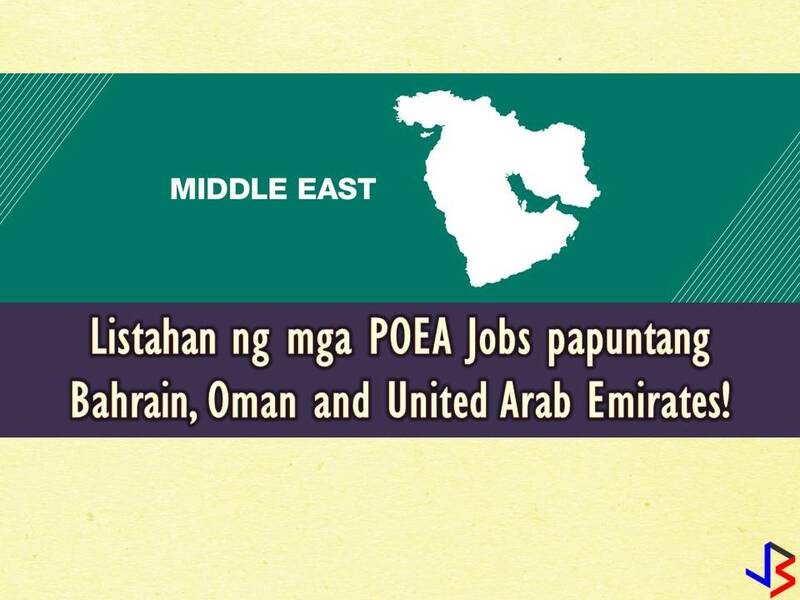 Below is the list of jobs approved by the Philippine Overseas Employment Administration (POEA) to the said countries. Linked in each job orders are information of recruitment agencies where you can send your application. Please be reminded that jbsolis.com is not a recruitment agency, all information in this article is taken from POEA job posting sites and being sort out for much easier use. The contact information of recruitment agencies is also listed. Just click your desired jobs to view the recruiter's info where you can ask a further question and send your application. Any transaction entered with the following recruitment agencies is at applicants risk and account. Tanim-Bala, Still Alive At NAIA? How Filipinos In The UAE Can Get Free Oman Visa?